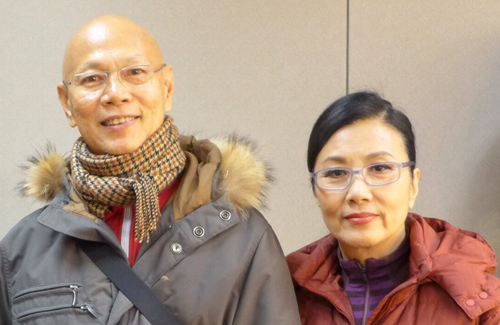 Actor Law Kar Ying (羅家英), the husband of Liza Wang (汪明荃), has emerged victorious from his decade-long battle with liver cancer. Following a brief hospitalization in late 2013 to remove a minor tumor, Kar Ying has fully recovered and is now more attentive to his health than ever. Kar Ying was first diagnosed with stage III liver cancer in 2004. After undergoing surgery in 2005, he was discharged from the hospital and stayed at home to recover. His wife, Liza, who herself had been diagnosed with early-stage breast cancer and thyroid gland cancer just three years previously, stepped away from her heavy workload in order to care for him. In December 2013, a 2-centimeter tumor was discovered on Kar Ying’s left liver, leading to rumors that his health condition had significantly declined. However, he later explained in an interview that the hospital had already surgically removed the tumor and that he was fully recovered. Kar Ying recently attended an event in Nanjing to celebrate the third anniversary of an oral cavity hospital, where he appeared to be in full health. “I don’t need chemotherapy or surgery anymore,” he announced. Primarily known for his work in the Cantonese opera, Kar Ying became widely popular due to his collaborations with Stephen Chow (周星馳) in the 1990s, including A Chinese Odyssey <大話西遊> and From Beijing with Love <國產凌凌漆>. He and his wife Liza met in 1987 when they starred in a Cantonese opera together; they officially tied the knot in 2009 in Las Vegas. This article is written Joanna for JayneStars.com. I think the most important thing for a person having cancer is stay positively and be happy. Law Ka Ying’s plesant living habits and positive attitudes have changed Liza Wong’s mentality quite a bit.